Well, they are green, and they're the most natural way to get rid of bugs. Thats the only reason I don't like to spray the bugs; I want to leave as much food for my wildlife as possible! 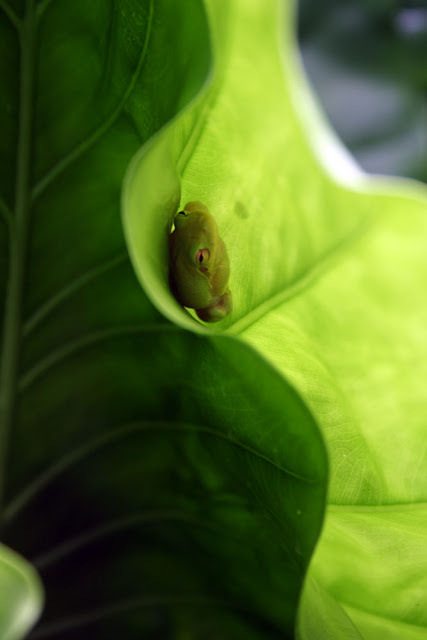 I found several treefrogs napping throughout the garden today, but the above photos contain my favorite, hunkering down between two alocasia leaves in the backyard. The tight spot reminds me of a cocoon. The second photo seems almost abstract to me, and the curve seems evocative of yin and yang. Well, maybe just yin. 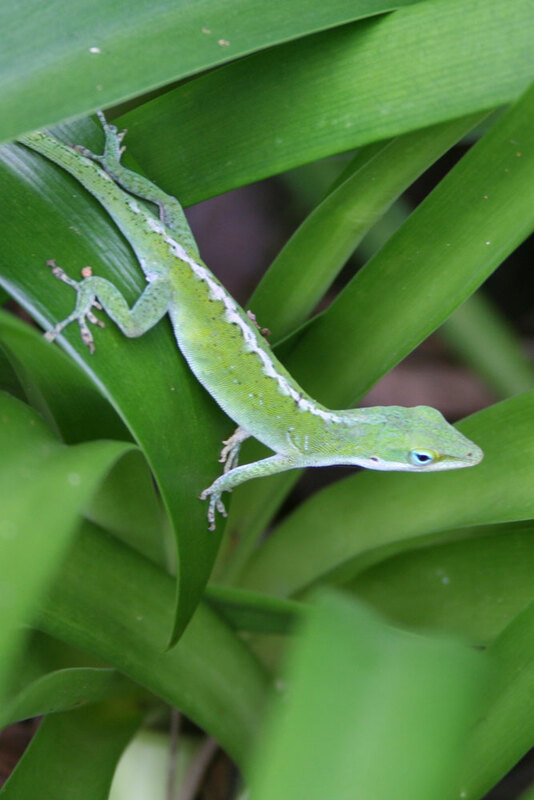 This green anole was stalking nasty bugs on my agapanthus leaves, and for that I am grateful. The plant hoppers and katydids are quite numerous this year, and the mosquitoes are just starting to get irksome! Dine away, my elegant little friend! Wow those are beautiful photos! I wish I had those lil critters in my garden. Oh, beautiful creatures! Definitely the best pest control. I've noticed the bugs are worse this year in my garden than I've ever seen. But the spiders are out in large numbers now, so hopefully things will get back into balance. err... I hope they don't come to my garden... scary! I enjoy seeing these in my garden as well. So far, I've been no-spray in hopes of keeping the green tree frogs and the balance of nature. Last year I was overrun with Cuban tree frogs but I think the cold got most of them this year. The non-native Cuban frogs were eating my little greenies. FANTASTIC photos!! These should be framed!!! 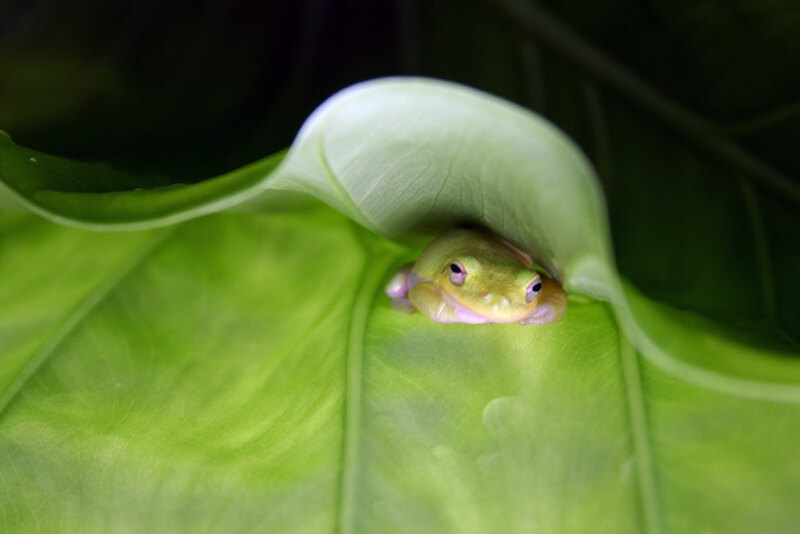 I love the frogs...so sweet. And they have a nice song, too!